Totally a great news. Now, it is time for Bodhi to wave his magic wand and also hope will include a support for an FDT kernel on this uboot. I don't think bodhi has a steam link, otherwise he wouldn't have asked me for the output of all those commands. Or did I miss something? I do have a Steamlink. Just too busy to open it up! I'm afraid I'm going to spend all my weekend hacking if I did :) Besides, I'd like others to participate, I don't want to do it all myself. I'm finishing up the Dreamplug instruction in the other thread and will get to see if I can connect serial console for the Steamlink. > participate, I don't want to do it all myself. I would help, but I don't have the tools or the knowhow. Frankly, when comes to soldering I tend to fry either my fingers or the board. Comes with the condition I guess. As soon as we know for sure, that we can have serial console access and use it to repurpose the steam link I will order a hand full of those cheap serial to USB converter with CP2102 chips from China. Those boards are small and about $1.20 each, so I don't have to think twice about fitting them permanently inside the case with the microUSB port waiting. I used to use these things too. Since last year, I just use RPi Zero / minicom / kwboot . Just connect the box serial port to RPi zero's serial port directly, then run minicom or kwboot. RPi Zero was 99 cents 2 years ago for some time? > Zero was 99 cents 2 years ago for some time? RPi Zero for 99ct? Never heard of such an offer, even if, you couldn't buy more than 1 each order, even now. > Those boards are small and about $1.20 each, so I don't have to think twice about fitting them permanently inside the case with the microUSB port waiting. If a standard USB plug doesn't bother you, perhaps a PL2303 USB/serial console dongle for as low as US 50¢ from AliExpress and/or US 70¢ e-Bay will save you $$$. I have been using this PL2303 USB/serial console dongle to connect all my Seagate Dockstar, GoFLEX NET/Home, Pogoplug Pro, etc., to my computer's USB port and use minicom sans any problems. > > Zero was 99 cents 2 years ago for some time? > RPi Zero for 99ct? Never heard of such an offer, even if, you couldn't buy more than 1 each order, even now. Perhaps, if you do a google search, you will find a lot of hits on this subject posted somewhere around 6/16 (almost two years ago). IIRC, I did not bother to buy it because it doesn't have an RJ-45 port nor a WiFi, but never thought of using it as a serial console until the offer was gone. 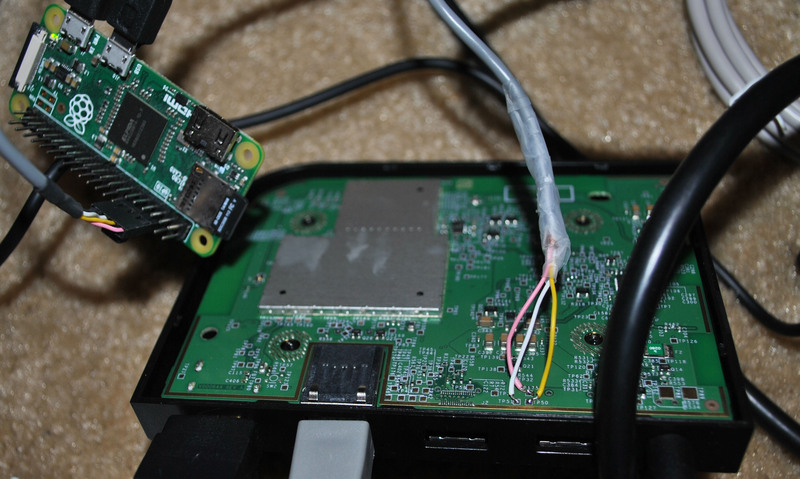 b4 using RPi as the serial console, I used a fake Nokia ca-42 cable from eBay. Cut the cable, connect usb port to computer, the other end to the boxes. PL2303 clone, no drivers needed under windows XP and 7 at least. > windows XP and 7 at least. Nokia-42 cable is the best! That’s my travel/mobile serial adapter. For normal use, I have the CP2xxx permanently plugged in to a Dockstar. The Pi Zero W seems really good to use as a all-pupose tool. > used a fake Nokia ca-42 cable from eBay. Someone gave me such a Nokia ca-42 cable and it worked flawlessly until it ceased to decease after a few years of use. Now, my USB/serial console cables are all inexpensive PL2303. If I can find any inexpensive CP2xxx for 50¢ or less, I sure don't mind to invest on such a dongle. Let me add some new stuff. I opened my steamlink tonight. Poweron the steamlink, I got something. Compiled on May  7 2017, 05:18:49. Enhanced SLC cannot be supported on this NAND flash. nand_randomizer_init_by_flash_type(chip_id = 0x2C68044AA900): !!! UNRANDOMIZED ! [    0.000000] GIC CPU mask not found - kernel will fail to boot. [    0.066593] [Galois][shm_driver] shm_device_create OK.
[    0.066610] [Galois][shm_driver] shm_device_create OK.
[    9.135790] BT: FW already downloaded! Login at console with root / steamlink, run dmesg. [    6.413396] 8897mlan: module license 'Marvell Proprietary' taints kernel. [   11.103074] gpu warning: of_property_read_u32 for 3D core-clock-register fai! [   11.103084] gpu warning: of_property_read_u32 for 3D sys-clock-register fail! [   11.103089] gpu warning: of_property_read_u32 for 3D core-clock-bitfield fai! [   11.103094] gpu warning: of_property_read_u32 for 3D sys-clock-bitfield fail! Looks like we can not stop the boot process. If sent a lot ctrl-c to the console, it will stop some scripts and get a failed boot. [    0.066642] [Galois][shm_driver] shm_device_create OK.
[    0.066658] [Galois][shm_driver] shm_device_create OK.
Cut a CDROM audio cable and re-arrange the cables. OK. My serial console is on. Any more commands you need me to run? Post here. I will do it when I have time. Edited 1 time(s). Last edit at 02/23/2018 11:16PM by daviddyer. Your confirmation is certainly another step closer to unlocking this beast. Excellent! Any interesting things in this folder? Note: I opened it last night, I can see it did an automatic update. Edited 1 time(s). Last edit at 02/24/2018 05:30PM by daviddyer. 1. System and cpuinfo looks OK.
2. MTD are defined. But no mtd-utils installed. I wonder does this box has NAND only, or there is SPI flash? this should be somewhere in the various sites we've known. 3. The dmesg has too many errors so it cut off the useful part at the beginning! 4. /proc is interesting that it showed no /proc/device-tree. Which is bad, make the dmesg head even more important to see. 5. No /boot is unfortunate, because we would see more how it was built. But kernel source will once I can build it as they did. OK, I recall it is NAND flash. Just want to be sure.